We understand the importance of ensuring that your charitable gifts support organizations and causes you are passionate about and that your gifts are used as you intended. We listen to you and help you find ways to give for greatest impact. 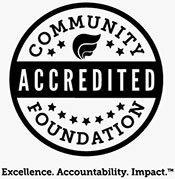 The Community Foundation of Shelby County is a collection of charitable funds. Each fund has a purpose for which grants are disbursed. Funds can be tailored to narrowly or broadly support causes, geographic areas, or organizations you favor. You decide what you want the charitable fund to accomplish and we will figure out which type of fund it is. Most charitable funds are intended to be long term or permanent. Investment returns and new gifts help grow the fund and provide the basis for the amounts disbursed as grants. Charitable Distribution Account grants are made from principal (gifts), because these are short-term donor advised funds. This is a short term Donor Advised fund that issues all gifts contributed to qualifying charitable organizations…sort of like a charitable checking account. It has no fund minimum size and the balance is not invested in the market, so the entire balance holds steady until used for grants. Your name is included with grant checks unless you request anonymity. It’s a great way to learn about grantmaking and charitable funds. The Community Foundation administers more than 25 Gift Accounts, including some that have existed since the accounts were made available in the late 1990s. Learn more about Gift Accounts.